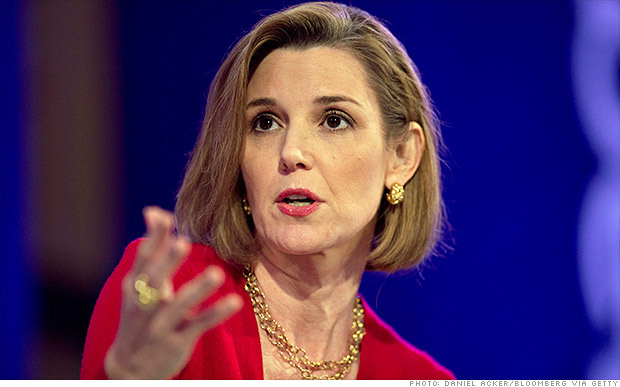 Sallie Krawcheck has some advice for young people on Wall Street. Speaking at an event hosted by the Simon Business School this week, Krawcheck offered 10 pieces of advice for how to succeed in business. Krawcheck says it's possible to do very well on Wall Street by following "the pack," but she says the first key to success in business is to develop your own sense of judgment and ethics. She gives several examples from her own career where she followed her gut and ended up on the right side of an ethical dilemma. At Citigroup (C), she pushed to have clients partly reimbursed for losses on assets the bank sold as low risk, but were whipped out when the market collapsed in 2008. She clashed with then CEO Vikram Pandit and was eventually let go, though Citigroup's board ultimately sided with her in the argument. Before that, she made a controversial decision to take Sanford Bernstein out of the underwriting business, a move that cost the firm money but avoided damaging conflicts of interest. Krawcheck says most successful people that she knows are "those folks who have a rabbi or rabbis of some kind." Not only will a sponsor offer helpful advice, but they will also go to bat for you if necessary, she says. At Bank of America, for example, her sponsor was then CEO Ken Lewis, but he stepped down three months after she arrived. When it came time to reorganize, Krawcheck had no sponsor to make the case that she should stay. Everyone makes mistakes, but most people will have plenty of victories too. In other words, "success is not an end point," says Krawcheck. She told the aspiring business people to be like a weeble, "to pop right back up after you fall down." Every day is a new opportunity to succeed, and you don't stop trying until you're dead. A majority of the 85 Broads network believes that gender discrimination still exists and is increasingly subtle. This is a problem because diversity is crucial for success in business, she says. Krawcheck says business leaders often make the mistake of hiring people who look and think the way they do because it's risky to hire someone unfamiliar. But she says research has shown that companies with diverse management teams outperform those that are more homogenous. She believes "group think" on Wall Street helped create the conditions for the 2008 financial crisis. Those in the industry at that time were not evil, she says, "we were just dumb." Networking is the number one "unwritten" rule for success in business, says Krawcheck. Making connections with people in your business circle will help you identify new opportunities, spot talent and learn about potential threats. But you have to nurture your network in order for it to yield results. Krawcheck recommends doing one favor for a person in your network and deepen a relationship at least once a month. Some people say that if you haven't been fired once in your career, then you're not trying hard enough. Krawcheck isn't one of those people, but she's getting there. She says a career without some ups and downs is not only boring, but probably a sign that "you're in the wrong industry." The days of spending an entire career at one company are in the past, she says. Life is too short. Take a close look at a company's values before accepting a job, recommends Krawcheck. For better or worse, there's still a high correlation between hard work and success. It may not come right away, but hard work is eventually rewarded, she says. Working too hard leads to poor performance. Downtime can lead to increased creativity. Krawcheck says she's had some of her best investment ideas on the weekend after playing with her children or while having her hair done. Krawcheck appeared on the front page of the Wall Street Journal after being "fired" from Bank of America. There are two ways to look at a situation like this, she says. The first is to say "Oh my god this is embarrassing. I know a lot of people read the Wall Street Journal…I think they're going to know." Another way to look at it, is to say "How cool is this? I'm on the front page of the Wall Street Journal." As a bonus, Krawcheck threw in one extra tip: Have fun.